Whole-grain pasta and white pasta have very little fat. But if you eat too much or add some sauces to your pasta, you might wind up taking in too many calories and gaining weight. The 2010 Dietary Guidelines for Americans encourages making at least half of your grains whole grains, so selecting whole-grain pasta instead of white pasta is a healthy choice. Whole-grain pasta is is made from the entire kernel of wheat. This means that the important nutrients, such as fiber, iron and B vitamins remain in the pasta. 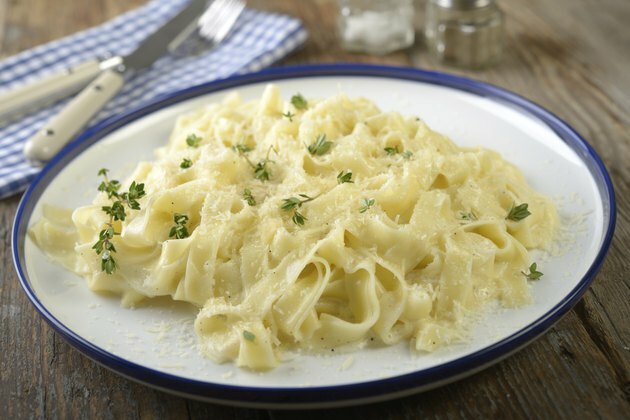 White pasta, on the other hand, is made with processed flour, which has lost important nutrients. For this reason, pastas made in the United States must be enriched and have iron and B vitamins added back in. Whole-grain and white pasta have about the same number of calories and fat per serving. The U.S. Department of Agriculture's MyPlate plan lists ½ cup cooked or 1 oz dried pasta as one serving. Most labels list 2 oz. as a serving. Two oz. or 1 cup of pasta have 200 calories. Both types of pasta are low in fat. Whole-grain pasta has 1.5 g of fat, and white pasta has 1 g. If you load your plate up, your fat intake will increase slightly, but your calorie intake will increase more. Measuring your pasta with a measuring cup or food scale can help you determine how much pasta you should eat without overdoing it. One of the differences between whole-grain and white pasta is the amount of fiber. Whole-grain pasta has 6 g of fiber per serving, and white pasta has only 2 g. Fiber helps to fill you up without adding extra calories, so if you eat whole-grain pasta, you will feel full faster, and you will most likely eat less. This may keep you from overeating and gaining unwanted pounds. Most people don't eat just plain pasta. They cover it with various sauces, butter or oils. This is what can be fattening in a pasta dish. Cream-based sauces, such as Alfredo or cheese sauces are loaded with fat. Butter and oil are pure fat. Choosing a tomato-based sauce will lower the amount of fat you add to your pasta. Low-fat cream-based sauces are also available, or you can make your own. USDA: What Counts as an Ounce Equivalent of Grains?